The perfect drink? It’s quite a claim, but Koa is quite a beverage. Purified by nature and squeezed from 12 fresh fruits and vegetables. Koa is unlike anything else, redefining our ideas about healthy living. Koa delivers only the healthy part of fruits and vegetables – more than you may have thought possible from a natural beverage. Koa is a natural Olakino. Olakino is the healthiest parts squeezed from fruits & veggies. Olakino retains the natural goodness but skips the bad stuff. That means Koa can boast naturally occurring vitamins, minerals, electrolytes, and anti-oxidants without any additives or calories. A guilt free detox? Some might call that magic, we just call it Koa. This entry was posted in Beverage, Drink Trends, Juice, News, Newsletter, Product Review and tagged biodegradable, juice, koa, Naturally Good, us on June 3, 2015 by Staff Editor. Carlsberg unveils latest Carlsberg Circular Community initiative at World Economic Forum in Davos. New Community partners also announced. DAVOS, 22nd January, 2015 – In the context of its participation in a panel on Wasteless Supply at the World Economic Forum in Davos, Carlsberg today announced a ground-breaking agreement to develop the world’s first fully biodegradable wood-fiber bottle for beverages. Carlsberg has initiated a three-year project with packaging company ecoXpac, with the collaboration of Innovation Fund Denmark and the Technical University of Denmark, to develop a biodegradable and biobased bottle made from sustainably sourced wood-fiber, to be known as the “Green Fiber Bottle”. All materials used in the bottle, including the cap, will be developed using bio-based and biodegradable materials – primarily, sustainably sourced wood-fibers – allowing the bottle to be responsibly degraded. This latest initiative forms part of the Carlsberg Circular Community (CCC), a cooperation between Carlsberg and selected partners whose aim is to pursue a circular, zero-waste economy by using the Cradle to Cradle® (C2C®) framework when developing and marketing new products. The CCC currently comprises six founding partners, with two new partners, ecoXpac and 1HQ (a global branding agency), announced today. Its goal is to have 15 partners by 2016. The Carlsberg Group is one of the leading brewery groups in the world, with a large portfolio of beer and other beverage brands. Our flagship brand – Carlsberg – is one of the best-known beer brands in the world and the Baltika, Carlsberg and Tuborg brands are among the eight biggest brands in Europe. More than 45,000 people work for the Carlsberg Group, and our products are sold in more than 150 markets. In 2013, the Carlsberg Group sold 120 million hectolitres of beer, which is about 36 billion bottles of beer. This entry was posted in Beer, Beverage, Drink Trends, News, Newsletter, Packaging and tagged beer, biodegradable, carlsberg, eco-friendly on February 24, 2015 by Frank. Citrus Sport 24 Deodorant ingredients : Glycerin, aqua, sodium stearate, citrus grandis (grapefruit) seed extract, steareth-100, usnea barbata (lichen) extract, aloe barbadensis leaf juice, chamomilla recutita (matricaria) flower extract, citrus aurantium dulcis (orange) oil, citrus medica limonum (lemon) peel oil, sodium bicarbonate, ethylhexylglycerin, stearyl alcohol, bisabolol. This entry was posted in News, Personal Care and tagged biodegradable, deodorant, personal care, vegan on September 24, 2013 by Frank. I’ve been trying to quit soda for the past few weeks thanks to too many hours on Reddit and constant streams of photos that displayed how much sugar was in a can of Coke. As a result, there are untouched cans of soda sitting my fridge with no one to claim them, but it felt irresponsible if I just gave them to the kids next door. If only this eco-friendly concept cellphone existed. The design, by China-based Daizi Zheng, claims that a Nokia phone could be powered solely on sugary drinks. Now there’s an interesting use of leftover Coke that’s much more excitable than cleaning the rust off my pennies. According to Zheng’s thesis, the phone would contain a chemical board that can form a reaction to utilize sugar enzymes and carbohydrates and convert them into electric power. The phone would work with most sugary drinks; in fact, more sugar means longer battery life. When the sugar and carbs are all used up as battery, you’re left over with a liquid that’s biodegradable, and the phone can be cleaned, refilled, and reused once again. “Bio-batteries are fully biodegradable and have, on a single charge, a potential life-span three to four times longer than conventional lithium batteries,” Zheng writes on his website. Keep in mind, however, this design would be used with a basic, barebone phone, so no sticky touchscreen and apps here. Since the design aims to be environmentally-friendly, it’s probably better to use straight sugar water than Coke or other packaged sodas, considering how they tend come in plastic bottles or cans — both of which are already pretty expensive to recycle. Still, it would be cool if the phone doubled as a drink bottle so you can choose to either gulp your soda or conserve it for more phone battery. This rationale would force the user to pick between drinking an unhealthy beverage or forgo it for the sake of your gadget’s usability. 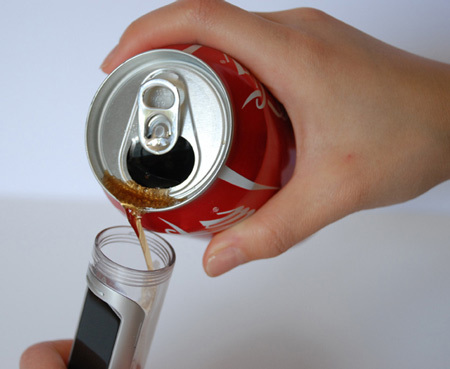 However, since the sugar disappears as the phone uses up the battery, it is unlikely that the soda you do end up drinking from the phone would taste any good. We also have to wonder if the fizzy noise would interfere with your sugar high calls. It’s an interesting approach at multi-purposing a notorious food item, and such a gadget would make a neat science experiment for kids to learn about the wonders (and potential harms) of what sugary drinks means to them, and the chemical world. This entry was posted in Beverage, Drink Trends, News, Technology and tagged biodegradable, cellphone, drinks, eco, phone, sugary, sugary drinks on October 15, 2012 by Frank. A new Coca Cola bottle design throughout Central America is actually a plastic bag. This helps keep costs down and is good for the environment! We all know the iconic Coca Cola bottle, which, to be honest, looks like a curvy model, with its unique contouring and shape. However, what many people do not know is that rather than drink Coca Cola out of these bottles, many men and women throughout Central America actually drink Coca Cola out of a plastic sandwich bag. Why is this? Simply put, the cost of the bottle itself plus the fee for recycling raises the price, making it too expensive for even the most addicted Coca Cola drinkers. In an effort to provide an easier way to drink…and promote further branding, Coca Cola has come up with “The Coca Cola Bag.” This bag is in the same shape of the bottle but made out of plastic that is bio-degradable and therefore eco-friendly (way to go Coca Cola). The bag is able to lock in the fizz and provides a more interesting drinking experience. Furthermore, men and women do not have to pay for the bottle, which includes the recycling fee. This entry was posted in News, Packaging and tagged bag, Bio-Degradable, biodegradable, bottle, central america, coca cola, packaging on July 13, 2012 by Frank.